More updates below but one final update needs to go up here before I lock this post. We’re hearing that this could be a multi-touch device. Unconfirmed at the moment. It looks extremely thin. Viliv have a challenger! Windows 7 delivers a great media experience with the Menlow platform so this makes sense for Archos although I wonder if they’re adding a user interface layer. I’m worried about the hard drive though. That could be a bottlekneck for Windows 7 as it has been in the past on UMPCs. What better innovation for a MiniPC than to get rid of keyboards? ARCHOS once again is leading the way in innovation, with the introduction of the MiniPC of the future, the ARCHOS 9PCtablet. The ARCHOS design team has coupled groundbreaking design with the most advanced technologies, by leveraging their expertise from the design of the Internet Media Tablets. The new PC combines the performance of a high end PC with breathtaking aesthetics, excellent ergonomics and a tactile interface that ARCHOS has built their reputation on. Pure lines, extreme thinness (0.63”), less than 800g and a stunning black finish, the ARCHOS 9 pushes the boundaries of elegance and simplicity on a MiniPC, fulfilling all expectations of the most mobile users. Intuitive and easy to use, the ARCHOS 9 delivers an unrivalled user experience, and is set to replace the traditional computer. Without a physical keyboard, it provides a virtual keyboard, very easy to use on the the resistive touchscreen, and has an optical trackpoint to let you surf the web, communicate, work and entertain anywhere. The ARCHOS 9 incorporates the new Intel® ATOMâ„¢ Z515 processor, an 80 GB1 hard disk, Bluetooth to tether wireless accessories, and 2 antennas to receive DVBT TV with diversity reception. 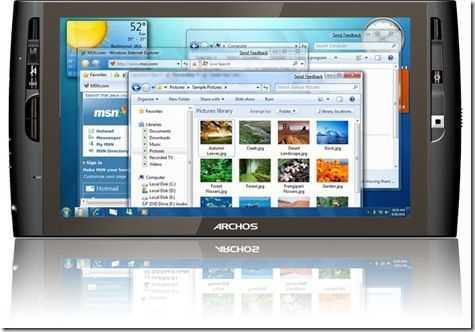 And what’s more, the ARCHOS 9 is running Microsoft® Windows 7, the latest version of the most commonly used operating system in the world. 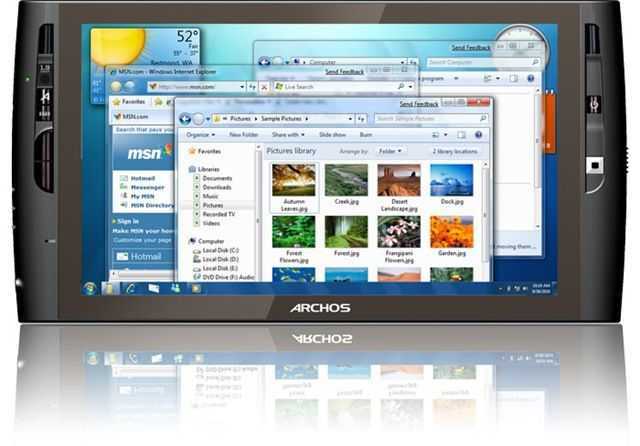 The ARCHOS 9 provides all the power and comfort needed for daily usage. 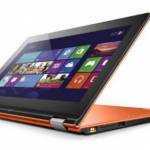 It combines an impressive performance and a rich multimedia experience to deliver the most advanced PC in the world. Be ready to discover it. Update: There’s a press release in French. 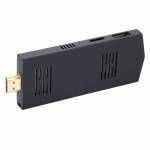 Box Contents : ARCHOS 9PCtablet, battery, adapter / charger, quick start guide. Update: Archosfans have their Ustream video available and will post the high quality footage soon. Is it just me or does it look like they have Aero turned on? That would be quite an acomplishment for any UMPC to have as standard and not be a draw on resources! not really…have you ever used Windows 7? The way it handles resources is EXTREMELY better than vista…practically everything over 1GHz can run Areo without much speed impairments at all. Know what you mean about 7 and its resources (never seen anything work better) but I’m refering to the acual ablity of the GPU to kick out DirectX 10 graphics :D.
Window 7 will be launced on Oct. 22nd. That means that Archos will launch the device at a same time or any chance to have it earlier?? 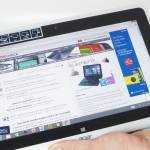 I think October 22nd is a public release of Windows 7 and that OEMs will have sooner than that. What will be the typing speed on it? So this one will definitely come to Europe/Germany? This is one advantage over the viliv… Really looking forward to first Hands-On videos of this nice gadget! The SCREEN is resistive, but MULTITOUCH ! BREAKING NEWS : The Archos 9 screen is NOT capacitive. It is MULTITOUCH. Excelent. I was asking Charbax about it but couldn’t get a response. Did anybody find any specs of future Android device? but where did you find about 150gm? The Archos CEO said 150 grams during the keynote. Looking very good. but it to big! Wel hello there….. I m a big fan of archos inspite of its buggy querky widgets and plug ins for 605 I still prefer this to the Ipod touch and as a result Ill probably get one of these – I have my ppc for day to day stuff and will use this (with a usb dongle if the 3g version is too dear) for long trips and such. I WAS interested iun the viliv but at the same price AND I would have product support in the UK I would much rather get this. I was planning on trying to get a cheap HTC shift or a oqo 02 but this a BT keyboard and USB dongle and Im sold – plus a big HD and (I would predict) some media based jiggery pocery from the Co that made their name with PMP players? Or If Im wrong Ill just throw gom player on it and use my htc hd format mp4s. Oh and is that a typo 23 inches diagonal? Do the trigonomotry on the specs [256mm x 134mm x 16mm (approximately)] did you mean 23 cms? Oh and I read the press release and it looks like a huge amount of media support is coming with this little baby. Yeah the Archos OS has always been buggy… very interesting device with Windows 7.
http://bit.ly/AftGN Does this Brand new Windows 7 Archos Multi-Touch device run hackintosh? If so you all know I will own it. cool looking, interesting idea, but at 10″ across this thing is as big as a netbook. it’s a tablet pc you idiot! I’m guessing 500 Euros will get you the base, non-3G enabled model. Isn’t that a bit expensive considering that this is just a netbook with a touchscreen but no keyboard? The battery life is what I am worried about this device. I’m skeptical that with a larger screen and thinner build and only a 200gram difference (assuming it weighs the full 800 grams) from the X70 if it will have 5+ hours video play. Well written drivers may make the difference. Well, I guess if you look at the S5 to X70 weight difference, 260 grams, maybe it is possible. 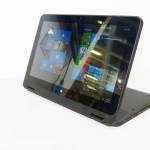 Anybody else interested in how a specific T91 (supposedly resistive screen) demonstrated multitouch with Windows 7 and how this device will have multitouch with Windows 7 and a resistive screen also? Ooops! I meant Archos 9 not 7. Sorry. Absolutely, viliv x70ex looks much & much better. Does anyone know if this will have a GPS add on? is it possible to use this as a drawing device? ala, a portable wacom cintiq? i have a cintiq but it requires hooking up to an existing pc. how is the ink/writing/drawing using the stylus for this device? i also own the archos 705 wifi 7″ screen. unfortunately, archos locked that device down hard. i want to be able to run my own app from my pc. i hope archos doesn’t put some sort of serial lock on the archos 9 device that prevent users from installing their own application or changing out the operating system. this and the x-mode tablet look awesome. it’s going to be an exciting year for umpc.